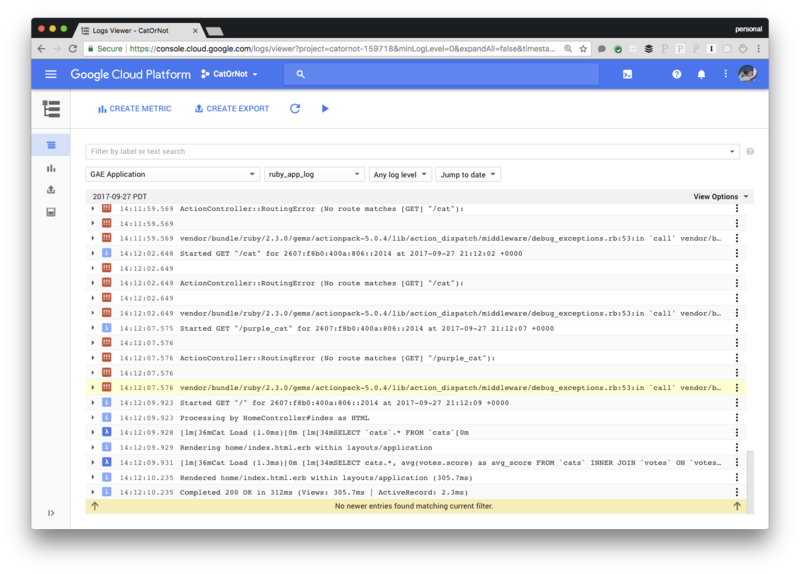 The Google Cloud Ruby team continues to expand our support for Ruby apps running on Google Cloud Platform (GCP). 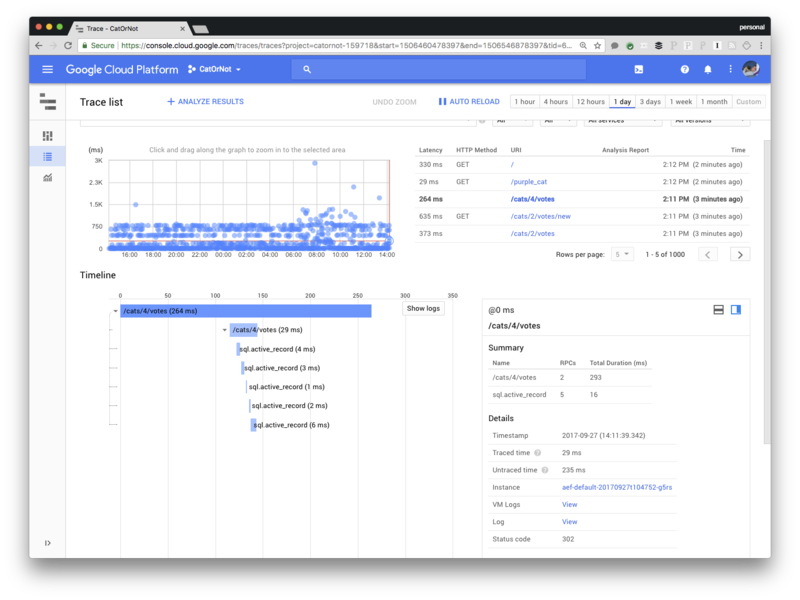 Case in point, we’ve released beta gems for Stackdriver, our monitoring, logging and diagnostics suite. Now you can use Stackdriver in your Ruby projects not only on GCP but also on AWS and in your own data center. You can read more about the libraries on GitHub. Like with all our Ruby libraries, we’re focused on ensuring the Stackdriver libraries make sense to Rubyists and helps them do their jobs more easily. Installation is easy. With Rails, simply add the “stackdriver” gem to your Gemfile and the entire suite is automatically loaded for you. With other Rack-based web frameworks like Sinatra, you require the gem and use the provided middleware. Stackdriver Debugger is my favorite Stackdriver product. It provides live, production debugging without needing to redeploy. Once you’ve included the gem in your application, go to Cloud Console, upload your code (or point the debugger at a repository) and you’ll get snapshots of your running application including variable values and stacktraces. You can even add arbitrary log lines to your running application without having to redeploy it. Better yet, Debugger captures all this information in just one request to minimize the impact on your running application. 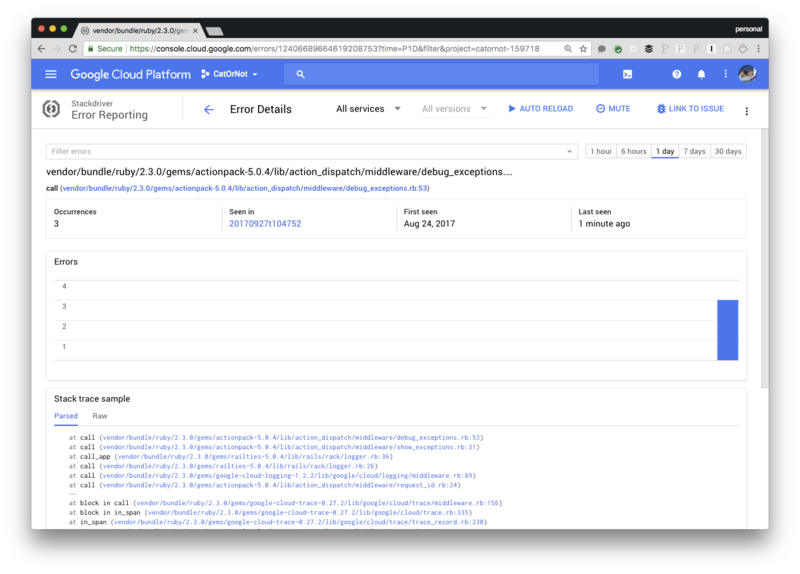 Stackdriver Error Reporting is Google Cloud’s exception detection and reporting tool. It catches crashes in your application, groups them logically, alerts you to them (with appropriate alerting back-off), and displays them for you neatly in the UI. The UI shows you stacktraces of the errors and links to logs and distributed traces for each crash, and lets you acknowledge errors and link a group of errors to a bug in your bug database so you can keep better track of what is going on. In addition to automatically detecting errors, Stackdriver Error Reporting lets you send errors from your code in just a single line. Stackdriver Logging’s Ruby library was already generally available, and is currently being used by many of Container Engine customers in conjunction with the fluentd logging agent. You can use the logging library even if you don’t use Container Engine, since it’s a drop-in replacement for the Ruby and Rails Logger. And when the Stackdriver gem is included in a Rails application, information like request latency is automatically pushed to Stackdriver Logging as well. You can find instructions for getting started with the Stackdriver gems on GitHub. The Stackdriver gems are currently in beta, and we’re eager for folks to try them out and give us feedback either in the Ruby channel on the GCP Slack or on GitHub, so we can make the libraries as useful and helpful as possible to the Ruby community.